The Renaissance | Ms. Burke's Site of Fun! 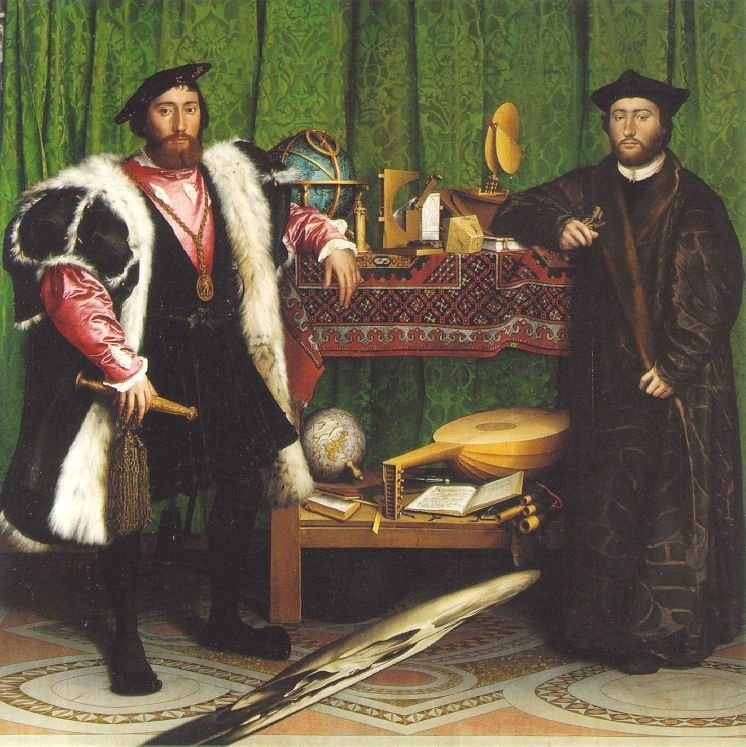 Hans Holbein, The Ambassadors. Check out that oddly-shaped diagonal object in the center bottom of the painting! The Renaissance has long been regarded as a fascinating period in history as well as literature. The “re-birth” of classical learning from ancient Greece, Rome, and the Near East, the invention of the printing press, the Reformation — all of these discoveries, rediscoveries, innovations, and intellectual revolutions led to an “information explosion” that utterly changed the world from the medieval system into a system we can recognize as fully modern. The literature from this period reflects a growing optimism, a belief in the humanist doctrine that “man is the measure of all things,” but is often tempered with a sense that life is fleeting and often precarious. The English Renaissance also saw the emergence of its most celebrated poet and playwright, William Shakespeare, whose works are considered the greatest in English literature. NOTE: Outline or take textual notes on all textbook information that you are asked to read. I will give occasional open-note quizzes, so taking notes will definitely help your understanding. Please note that all reading assignments, unless otherwise specified, refer to your text, The Language of Literature. Read pp. 274-281 in your text and take outline notes or make annotations. Prior to reading Wyatt’s poetry, please read biographical material for Thomas Wyatt on pp. 283 and 288. Prior to reading Marlowe’s poetry, please read biographical material for Christopher Marlowe, pp. 289 and 294. Prior to reading Raleigh’s poetry, please read biographical material for Sir Walter Raleigh, p. 294. Prior to reading Andrew Marvell’s poetry, please read the biographical materials on p. 464. Prior to reading Shakespeare’s poetry, please read information on the sonnet form, pp. 295-296 and on Shakespeare himself, p. 302. OPTIONAL: This history site is very helpful! They have pages on Tudor England, Henry VIII, and basically any other history topic you can name. Please read Thomas Wyatt’s late-1520’s poem, “Whoso List to Hunt.” NOTE: Please click the link. This poem isn’t in your textbook. Please read Raleigh’s pre- 1599 poem, “The Nymph’s Reply,” p. 292. Please read Robert Herrick’s 1648 poem,”To the Virgins, to Make Much of Time,” p. 464. Please read Andrew Marvell’s 1681 poem, “To His Coy Mistress,” p. 241. Please read Shakespeare’s “Sonnet 29,” p. 303; “Sonnet 116,” p. 304, and “Sonnet 130,” p. 305. The approximate composition dates for these poems is in the late 1590’s. Note: Sorry about messing up the chronology here and putting Shakespeare’s sonnets after Marvell, but the necessity of leading into the Shakespeare play after this dictated this change. Note: This is a possible paper assignment that may be given during this unit. It is placed here for your convenience and review if you would like to see a typical close reading assignment. NOTE: Below are questions we will most likely be addressing in class. These are put here for your convenience and reflection. It would be helpful to you for you to review these questions and think about how you would answer them before we discuss these works together. What is the tone of the nymph’s reply in Raleigh’s poem? Why the word “nymph” instead of “shepherdess”? How does Raleigh use – and distort – Marlowe’s images to make his point? What is his point? Why does this poem, written in the 17th century, remain popular in the 21st? What impression of the young man’s character and personality does the poem offer us? Describe the speaker’s tone/attitude in lines 31-32. What do you notice about its form? Since we are reading several sonnets, it would would be helpful to get a feel for the manner in which they are written. Choose ONE set of words below, and with that set, compose a sonnet (in iambic pentameter, of course) in which the lines end with the words below — in the order given. Please make sure that there are logical, sensible connections between the words so that the lines don’t read like a disconnected, random collection of isolated ideas. I know I do not need to tell you to make sure your sonnets are classroom-appropriate: of course you will. NOTE: This is an exercise we will do in class. It is put here for your convenience and reflection. Adapted from a similar exercise in Western Wind: An Introduction to Poetry (4th Ed. ), by John Frederick Nims. OPTIONAL: Desperate for more information about sonnet writing? Consult this outstanding website all about Shakespeare’s sonnets . NOTE: Some of the classical artwork may not be considered appropriate for all audiences. OPTIONAL: Listen to the MP3 file of “To His Coy Mistress” read aloud. Listen to the MP3 file of “The Passionate Shepherd” read aloud. OPTIONAL: Listen to free MP3 downloads of lectures on the European Renaissance from UC Berkeley. Note: College lectures are intended for a college audience. Content may not be appropriate for all audiences.